Staycation -- Last week, we shipped the kids up to Camp Grandma in NYC and I took the entire week off. Mrs. Quilt Dad and I thought of some short trips we could take, but decided instead to make it a "staycation" ... meaning a vacation where we don't go anywhere and just stay at home. It's my favorite kind of vacation, actually ... traveling can be so exhausting. So I know what you're all thinking ... a full week off of work + no kids + staying at home = tons and tons of uninterrupted sewing time, right? Well, not so much. You might ask what I was able to accomplish, to which I would answer "nothing". Instead, I spent the time with my wife -- we ate at some of our favorite restaurants (as well as some new ones), caught up on our summer movies (Star Trek, Wolverine, and Harry Potter were all on the schedule), tried to get outside and exercise (not as much as we should have), sleep in, and generally reconnect. It was bookended by overnight stays in Alexandria and Washington DC, for the "exchange of goods" with my mom. ... slip-up. I did have every intention of at least working on my July quilting bee commitments, but any sewing momentum that I had was quickly dashed after making a stoopid mistake. There's only one problem. After finishing the blocks I went back and re-read Tina's directions, and she specifically asked that we not add in any additional fabrics to her selection. D'oh!! I felt terrible. I still haven't yet tried to squeeze a third block out of the remnants of Tina's fabric, but I will. The bad news is that it killed my sewing mojo for the week. That was last week, and I still haven't gotten it back. 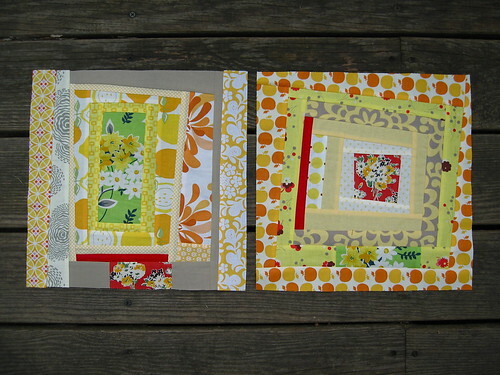 The bad news is that tomorrow is July 31, and I still have a BUNCH of July blocks to work on. I also have August fabrics of my own to send out to my SewConnected 3 group, and I haven't even started cutting it yet. Needless to say, I will be tardy this month. I'm going to try to tackle them this weekend ... no promises, but I will try my best. I hope my peeps can all forgive me! Surgery. Yes, one of my daughters is having surgery first thing tomorrow morning. Nothing serious, but it is surgery nonetheless, and she will be receiving anaesthesia. We're driving a couple of hours west to Winston-Salem, which is where she was born and where her surgeon is based. Again, it's nothing serious ... but please keep her in your thoughts and prayers this evening! Score! I have been on the lookout for the past year or so for a nice, big work table for cutting and, well, working, but haven't really been able to find anything. I've seen some great tips from other bloggers for making your own tables out of shelving units, door blanks, etc., but I've really been holding out for a big table like Jenny's. Go take a look at that link and marvel in her magical workspace -- you'll be glad you did! Anyhow, I was describing my want/need to a co-worker, and he told me about my local North Carolina State Surplus Property office. It's where all of the state departments and agencies dispose of any unneeded or recently-replaced property ... most notably, furniture. I headed over there one day last week in the hopes of finding a table that might be suitable for my needs and space. My timing was impeccable. They had just gotten in a shipment of 25 work tables recently released from the North Carolina State University School of Design. Ummm, hello? EXACTLY what I wanted. Granted, they are a little beat up, have tons of creative-student graffitti all over them, and a piece or two of dried gum stuck to the bottom. But I've got big plans for them. I've already bought some glossy white paint and will tackle that project when it cools down a bit. A true hidden gem. I recommend that you find out if your state has one of these near you! Jason Mraz is a favorite of mine too. I saw him open for Dave Matthews a few years ago, my absolute FAVE, and he stole the show. What an artist. I love the idea of a Staycation! I think that is fabulous! I also love Jason Mraz, and am a little jealous. I'll pray for daughter and her surgery. Good Luck. Jumping out lurkville to tell you that I love your blog and have been reading it for a while. Your Staycation sounds like a great idea. I'll pray for your little girl. we have yet to do that... great job on finding those work tables, my mom did that too. a huge thing, just perfect. happy catching up with your work! good luck! Well done on the tables! What a great resource! Hope all goes well and you get your sewing mojo back soon! A week without kids should definitely be spent doing nothing much. It makes up for doing so much the rest of the time. Keeping your little girl (and her anxious parents) in my prayers tonight. sounds like you had a great, and relaxing week on your staycation!! how i am envying you right now, a week with NO kids!! how awesome to go see jason mraz. my husband and i are going to see the dave matthews band over labor day week-end. oh no!!! I am pretty sure that Tina would love those blocks regardless, so don't stress yourself too much - ok? I am insanely jealous of your beat up, covered in student graffiti, odd bits of gum on the underneath tables. $5 a piece? That is some bargain. What a great score on the table, I have been on the hunt for one too! I am in Raleigh and went by there today......NOTHING! Lucky you! Glad you are back! It helps to hear that I'm not the only one behind on Sew Connected 3...still need to make my July block. Hope your little girl is well. See you soon! I love the way the blocks turned out, the fabric is wonderful! I'm so jealous that you saw Jason Mraz--I bet it was incredible! Hope all went well yesterday for your daughter's surgery. Have a great weekend! I am so happy for the update! I hope the surgery went well and I am glad that you and your sweetie got to spend some grown-up time together. I am so jealous that you got to see Jason Mraz...He is so great! Is he as good in concert?? I hope so. Another from lurkdom, :o) love the blocks, hope the mojo is back soon, staycation sounded great, and those tables! What a bargain! Hope the little one is recovering well. Staycation! Now that's an idea I could get used to! I've been eyeing Jenny's space for so long now as well. I even started painting my new quilt space that aqua color. I thought it would be a real nice color to spark the imagination. Fun. Hope everything went well with your daughters surgery. Nice score on the work tables. I'll have to see if the State of NY has a surplus property shop in Albany. That's great that you were able to get some alone time, just the two of you. Much needed I'm sure! I know what you mean about the sewing mojo! Maybe it's a summer thing, it seems to be going around. I'm sure yours will be returning soon! Great score on those work tables, those are the best kind (almost for nothing). I hope your daughters surgery goes fine, and she has a speedy recovery! God Bless! Please worry no longer my friend. I love the blocks! I am glad your daughter came through alright. Anesthesia is a hard thing for a parent to watch their kid go through. Did you let her have lots of ice cream? So, my idea is that you ought to buy up all of those tables and re-sell them on etsy. Local delivery only, of course. What a find! Thanks for recommending the Surplus Property office, I checked and it looks like Texas has one as well! I can't wait to visit it some time soon. Also, I totally love that wonky log cabin, quarter log cabin block you made, is there a tutorial for that somewhere? I think the Moda Bake Shop tutorial looks great! Thanks for sharing it. I just hope they post the printable PDF soon. Keep up the good work!